Remember my Goodwill mid-century tables that I discussed in this post? Well, progress has been made (cue applause). After my sad cry for help as to what to do with these small furniture gods, I took the generous advice given and purchased an orbital sander. We literally just chose a mid-range sander at Lowe’s and ran with it. Right. Way to get down with my socially-awkward bad self. Welcome to my life. Anyways, my original plan was to use Polyshades because I never-in-a-million-years thought that I’d actually get down to bare wood that could be stained with REAL STAIN. But I did. So, it was on. Next, I proceeded to hand-sand the base of the table. Which took FOR-ever. I literally got one of the short sides done and decided that I’d go the chemical stripper route . 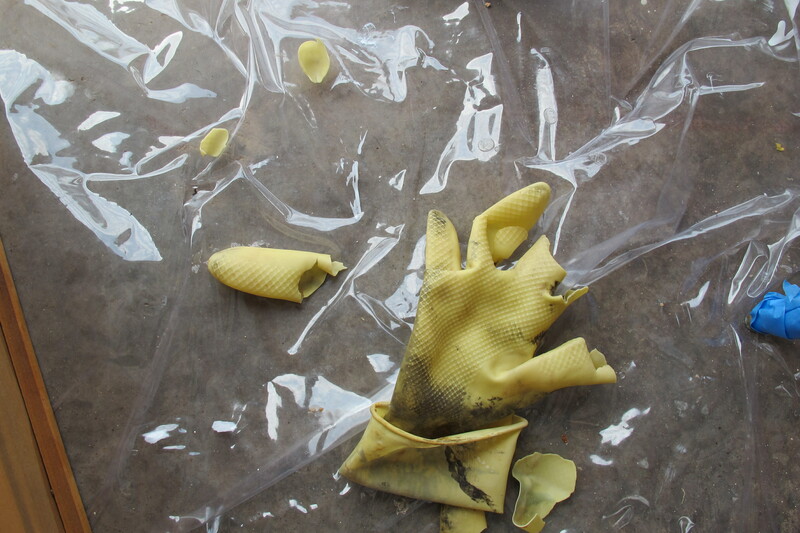 I’d never used chemical stripper before, so it was a little scary for me. I was wholly afraid I’d do it wrong and be scarred for life. But, then I did it anyways. 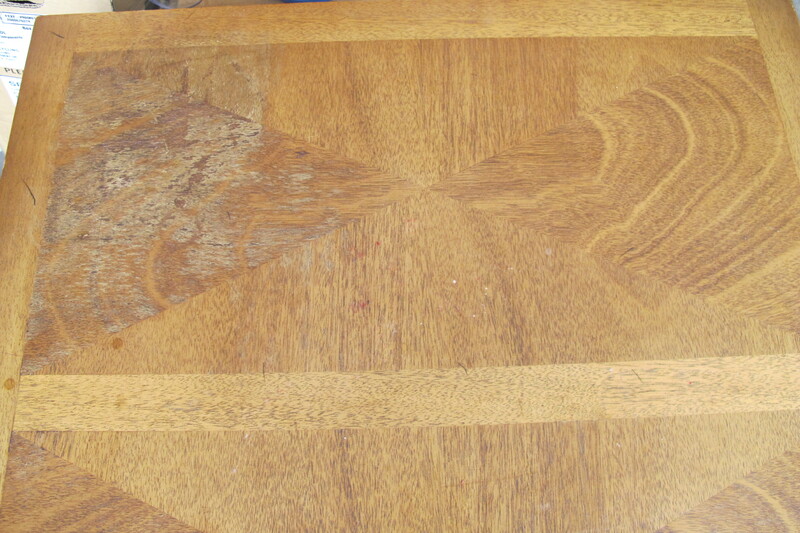 I hoped that stripping the table would allow me to be able to refinish it with stain (fingers crossed!). The damage seemed to go deep into the wood, so I wasn’t sure if I’d be able to pull it off, but figured it was worth a shot (…I told you… I’m a pathetic sappy when it comes to vintage finds #gottadoit). I waited about 2 hours (the directions said you could scrape in as little as 30 minutes or as long as 24 hours). And scraped and scraped, but found that scraping the rounded areas and details was somewhat difficult. And although the directions stated that the stripper remains wet for up to 24 hours, my guess is that these statements were not made in the Texas heat. Granted, I chose to do this during the polar vortex when it was 85 degrees (In July! In Texas??! ), under the shade of the garage. But the areas facing the driveway still became gummy and difficult to scrape in that time frame. And these were the heavy-duty gloves, folks! TIP: Buy more gloves than you think you need. And then (ahem!) 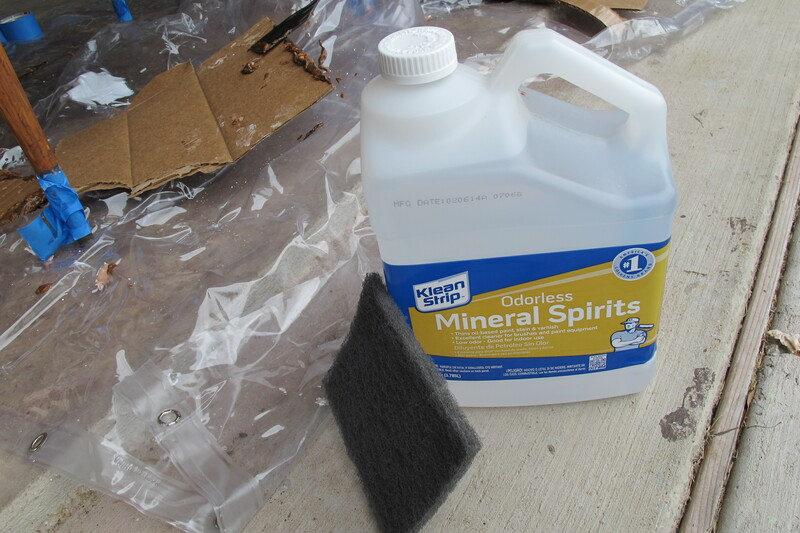 a few days later, I gave the table one last scrub down with the mineral spirits. 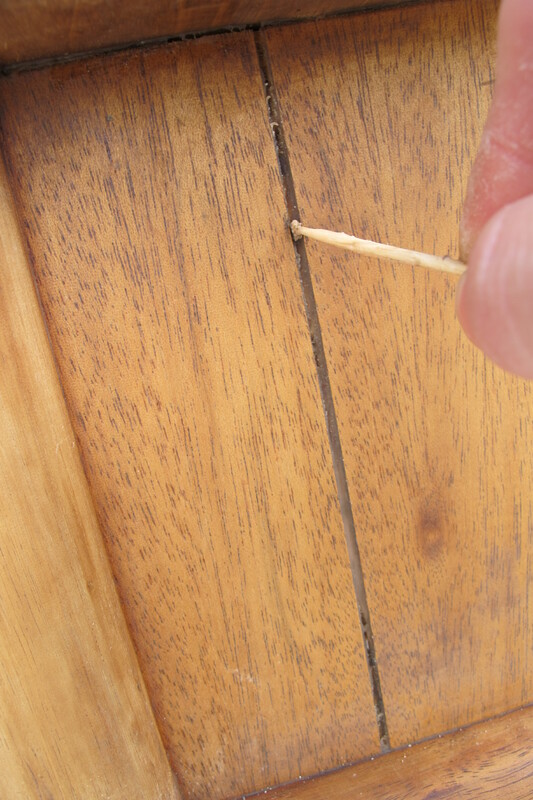 …so that it could be scraped out using a very small, pointy screwdriver. 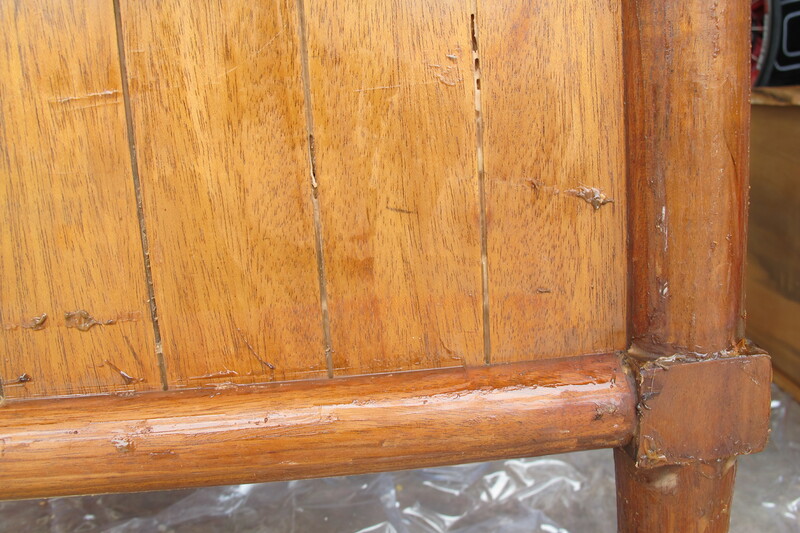 The top of the table looked pretty good at this point, but felt wavy to the touch where that large damaged area was. So, I took the orbital sander with 220 grit sandpaper to it. I got the top pretty smooth, but not perfect since I was afraid of sanding through the wood veneer. The texture is different from the rest of the top and the wood is slightly darker, but all-in-all it’s a vast improvement. I’m just curious if it’ll absorb the stain differently than the rest of the top. I guess I’ll just have to do it to find out. I still have to finish stripping the coffee table, but decided to fully finish this little end table first to be sure it comes out well once stained. Since I want the two tables to match, if staining the end table doesn’t work out, I’ll paint it, thus there’s no point in wasting time stripping the coffee table if this is the case. So, I’ll update ya’ll once that’s done. So anyways, that’s my story… Have ya’ll ever stripped furniture? Any stories to tell?? Tips?? Oh, I can’t wait for your next post. I’ve never tried to refinish anything so I’m anxiously watching to see how laborious it really is. I have several end tables that really need done. Good luck. 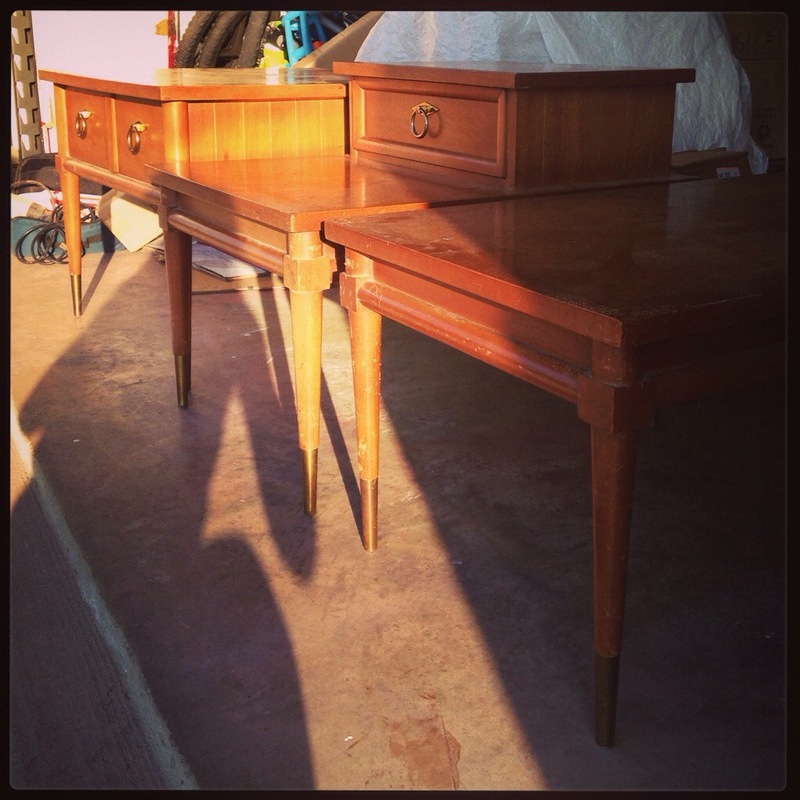 The last two pics showing the stripped end table are gorgeous! Fingers crossed the stain works out! Love the contrasting woods. I can’t wait to see how this all turns out!!! I have never used stripper and I’m so glad you tried it and posted about it! I always use my trusty orbital sander but for legs and tough grooves it’s definitely hard. They look so great though, can’t wait to see the finished product! Thanks, Bre! I’m so glad I gave it a whirl… it was so intimidating to me before and now I definitely know what to expect so it was worth it. Nice! I’m sooo scared to do anything beyond using spray paint on things, but you’ve inspired me to expand my horizons and get more handy! Yay! Goal accomplished! I’ve been wanting to use stripper for years and just now got the guts to do it. I think the not knowing was the worst part. Now that I’ve done it, though, I’d easily do it again. Thanks so much for the information!! 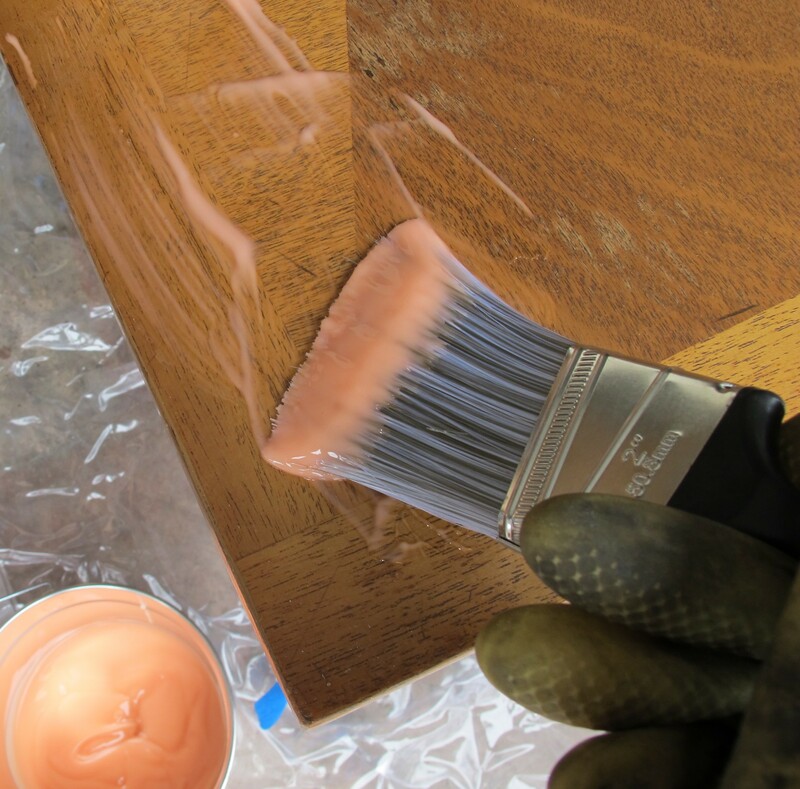 I wish I would’ve known to try the oil sooner… I’ve been working on the table this week and am totally regretting my choice in topcoat already. I hope I didn’t mess up the integrity of the table. Staying true to the piece is totally my goal. Christina….what are you using and how much have you done? 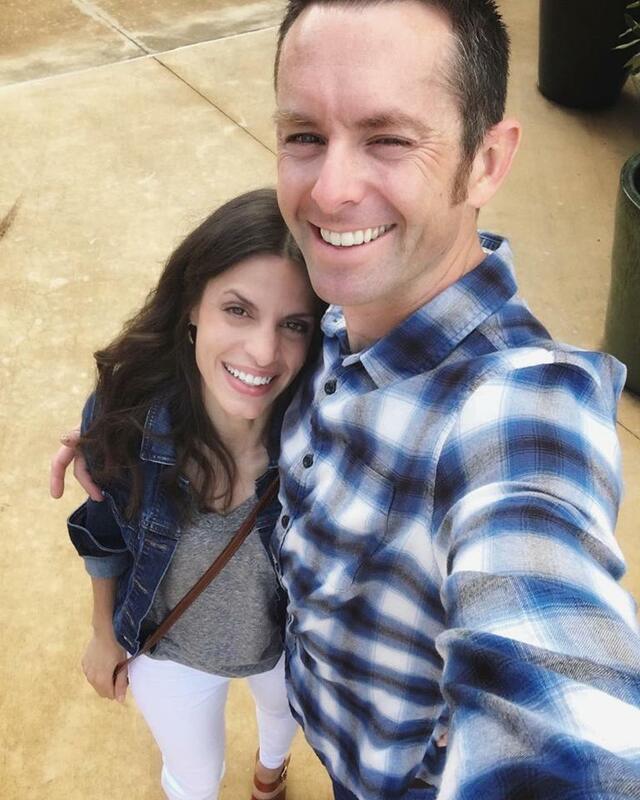 Check out my post for today. I go into detail about it (and I quoted your advice as well In the post… I hope you don’t mind. I just really appreciate it. I was wondering if the stripping advice you gave requires sanding as well. ). 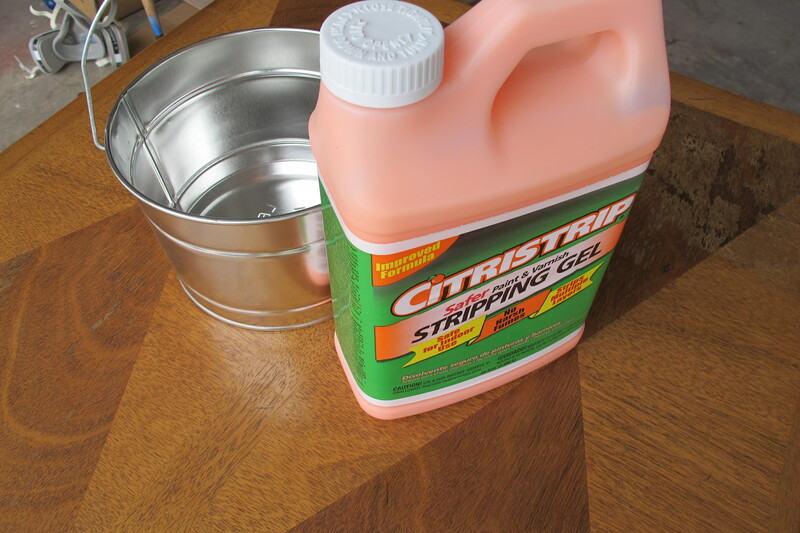 I used this exact stripping product on a table that was covered in 5 layers of paint. What a mess! I ran into the exact problems that you did – the stripper dried faster than the bottle said it would. I also found that I had to do my stripping in layers. It wound up taking a long time, so I went back to the store and picked up a much stronger stripper. Always! 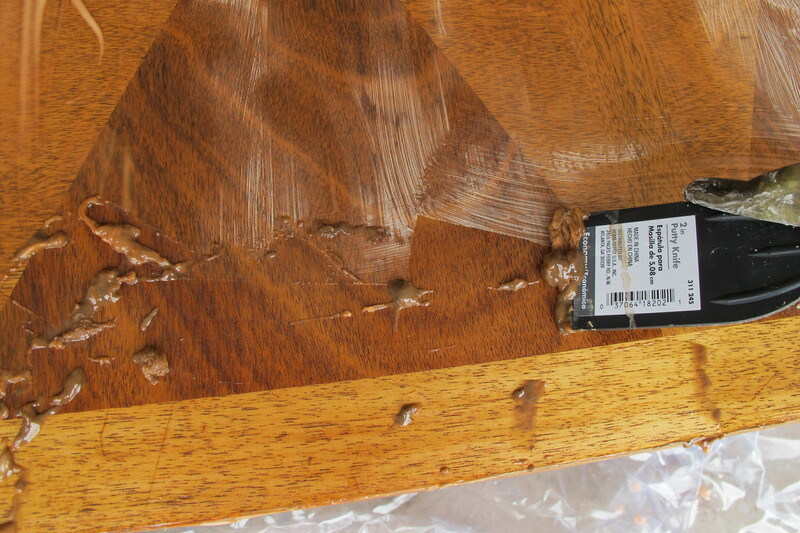 In writing this post (and having to re-strip the table again because of errors I made in finishing…DOH!) I learned that a toothbrush is AWESOME for getting the gunk out of nooks and crannies. It’s a total time-saver!! WOW. Your tables turned out beautiful! 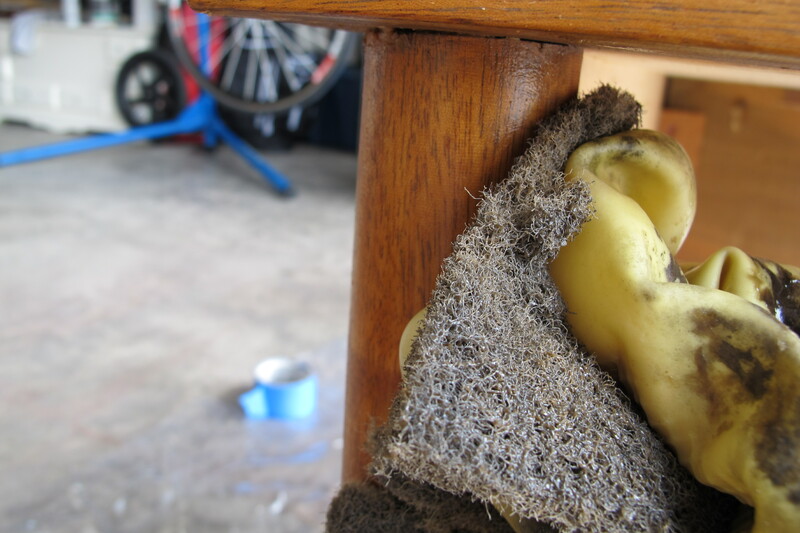 When using the products for stripping furniture, is it necessary to wear a mask to prevent breathing in fumes from the chemicals? If so, about how long would it take for the fumes to dissipate? Looking forward to seeing more of your work!